Cartoonish boxing hasn’t be faring so well recently. EA’s Facebreaker flopped harder than a beached whale, failing to ignite any interest in anyone. Maybe that’s because it wasn’t an established cartoon boxing franchise though. People seemed really excited for the new Punch Out on the Wii so I don’t think it’s the cartoony boxers that made the game not sell, but the lack of the game being good. Atari is banking on this as they’ve just announced that the next installment of the popular Ready 2 Rumble series will be coming out in Spring of 2009 for the Wii. 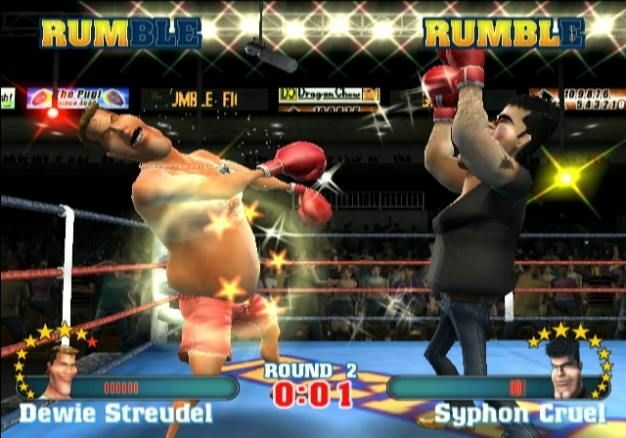 Ready 2 Rumble Revolution will feature 18 boxers based on celebrities from the worlds of entertainment, sports and music and make full use of the Wii’s motion controls, making it kind of like a Fox television show with flailing. Sounds like fans of Wii boxing will get a bit more depth than that game, but hopefully with better timing since MotionPlus will be headed our way by then. New this time around will be a mode that lets players design their own Ready 2 Rumble boxer, which will hopefully look nothing like a Mii. So is anyone actually ready to rumble or are we all just waiting until we can start punching people out?